I’ve been reading a lot of patterns by indie designers. Many indie designers can benefit from developing a style sheet to make their patterns more readable, consistent, and stand out from the pack. First, brand your patterns. That means thinking about the layout and the look of your pattern. Where you place things, font type and size, headers and footers, logos, helpful hints, color scheme all need to be decided prior to writing a word. What look and style you choose for your pages should remain consistent within the pattern and in other patterns that follow. The look and style becomes your brand, your calling card; it represents you and your design business. Font type and size is a good place to start. Did you know that most people in the US cannot read cursive writing? Cursive writing is script. An example is given below. Out of the 50 states that make up the US, 41 do not teach cursive writing in their school systems. So not only can people not read cursive writing but they are also unable to sign their names because they cannot do cursive writing. Therefore, when writing patterns do not use any font that resembles cursive writing anywhere in your pattern, including the pattern title and your company name. For the directions in the pattern you want an easy to read font, preferably serif. Studies have shown serif type makes reading long passages easier on the eyes. Fonts you want to avoid are anything with unusual or decorative lettering, overly wide letters, overly narrow letters, too thick letters, too thin letters. In short, avoid anything fancy. Times New Roman is a good font. Boring? Yes, but easily readable. Next is selecting font size. For the body text of the pattern, 11 or 12 pt is suggested. Anything smaller is harder to read. You want the knitter to be able to easily read the pattern. In summation: A good pattern font is Times New Roman, size 11. Next up: Size and font for title and headings. I have never in my life had a perfect glass of lemonade. Either it was too sweet, too tart, or too blah. In fact I stopped trying to find the right product many years ago. So when my neighbor and friend, Mary, offered me a glass of her homemade lemonade I wasn’t prepared to be wowed. Just one sip sent my taste buds spinning with delight. It was the perfect balance of sweet and tart, lemony and refreshing. The perfect glass of lemonade: the epitome of the taste of summer in a cool, tall glass. I’m not sure Mary would want to spend her days squeezing lemons, but she could make millions of dollars selling her perfect concoction. In other news, the back of the Girl’s 1960s Sweater is complete. The sweater is sized 12 mos, 18 mos, 24 mos, and 4 years. I purposely left out the 3 to 6 mos sizes because this has a nehru collar and the child needs to clearly have a neck. The necks of babies start to be defined around 9 mos. I’m knitting the 12 mos size. Before I begin the front, however, I want to write the pattern for the back. This is where I am stuck as the designer. I believe good patterns are clear, concise, and consistent in their directions so that the knitter can duplicate the garment with as little confusion as possible. The dot pattern stitch used is an 8 row pattern. However, only 2 of the 8 rows are patterned. The other 6 are alternate knit and purl rows. I figured the rate of decrease for the A-Line style and only 2 of the sizes rates coincide. The 18 mos and 4 year rates are different from each other and the other two sizes. The 2 patterned rows move the dot stitch so it alternates position and is not aligned in straight vertical rows. My problem is 2 of the 3 Cs: clear and concise. I don’t want to write out 59 or so rows of instructions 3 separate times to deal with the decreases that affect the dot pattern on just two rows, yet I don’t feel comfortable with the concise alternative of telling the knitter to “keep in pattern” while decreasing x stitches every y row z times. Knitters come to a pattern with very different experience levels. While the experienced knitter can easily figure the x y z direction, the intermediate knitter will struggle with it at first, and the knitter with limited experience will be lost completely, unable to read the knitting and decipher the stitch repeats and how they work. While the skill level for this pattern is intermediate I don’t want the knitter who is branching out, trying to learn new things to be frustrated and lost. I’ve thought of charting just the beginnings and ends of the 2 pattern rows for more clarity. But many knitters, regardless of level, aren’t chart readers. Thus, written directions are also needed. So I am stumped. Unsure how to be concise and clear at the same time to as many knitters as possible. A short information paragraph about the piece. This can include a brief statement about the inspiration for the piece. Point out noteworthy details such as a boatneck, unique details. Include a touch of romance about the piece. In other words sell it. Casual, elegant, modern, classic, comfortable, and flirty are the type of words used when romancing the piece. Finished Size List the finished chest sizes. Finished means the size of the garment after sewing and blocking. List the measurements in both inches and centimeters. Tell how much ease is worked into the garment. DK weight. South West Trading Company, Bamboo (100% bamboo; 250 yds [229m]/100g); Ocean Blue, 3 (4, 5, 6) skeins. Needles List needle sizes by mm (US Size) straight, circular or double pointed. For circular needles include the length. For example 4mm (US Size 6) 16″ circular needle. Always include the following direction: Adjust needle size as necessary to obtain gauge. Notions List stitch markers, stitch holders, darning needle or tapestry needle, the number of buttons and their sizes, ribbon it’s width and amount needed, crochet hook and its size, waste yarn, and cable needle. List all the items used in making the piece other than the yarn and knitting needles. 25 stitches and 30 rows = 4″ (10 cm) on 4 mm needles in moss stitch after blocking. I like to add Design Elements to the first page. This is where I list what the knitter will face when taking on my pattern. Under this heading I list such things as: short-rows, lace, seaming, raglan shaping, set-in sleeves, dropped shoulder, saddle shoulder, single crochet, provisional cast on, Kitchener stitch, cables. For a sock I list the type of heel, gusset, and type of heel flap. Any special cast ons or bind offs should be noted. On the second page list the Abbreviations used in the pattern. Usually this list is alphabetized with the abbreviation in bold type. Put the list in a two column format to keep it all on one page. I hope this small series on pattern writing has helped. It was not my intent for it to be all inclusive or the last word on pattern writing. The truth is, it just scratches the surface. To understand pattern writing you need to write patterns. Before I get to the writing part a short aside. I am at the graphing stage of the Shetland Baby Blanket. Last night I swatched two different edgings. Tonight I’d like to swatch the center. I am going with a borders out construction, though I’ve not decided whether I will knit it in the round as one continuous piece or knit the parts separately and sew / graft them together. Knitting it in the round means hundreds of stitches on the needles at one time. A knitting mistake could mean unknitting hundreds and hundreds of stitches. I found this interesting video from The Shetland Times about Shetland Wool Week. Click here to see the video. Now back to writing knitting patterns. Patterns define their designers. They identify and characterize designers to publishers, magazine editors and most importantly, the knitters who buy the patterns. Poorly written patterns can quickly sink a designer’s business. Knitters who have suffered through a poorly written pattern are unlikely to become repeat customers. They will also let others in the knitting community know of their dissatisfaction. Every pattern is a designer’s one chance to make a good first impression. No matter how many patterns the designer has published in the past, some knitter, somewhere is picking up your pattern for the first time. Learning good pattern writing is crucial to a designer’s business because no matter how fantastic the design, all that is lost if the writing is poor. The elements of good pattern writing are be clear, concise, consistent and accurate. Clear writing is easily understood. It leaves no doubt or confusion. The instructions are precise. One way to achieve this is always number rows and rounds. Do everything you can to avoid using the word “next” before the words row and round. “Next row” on top of “next row” and “next row” instructions tend to be confusing. The knitter is given shifting sand to stand on rather than sturdy, firm bedrock. The first to get lost in stacked up “next row” instructions is the sense of right side row and wrong side row. 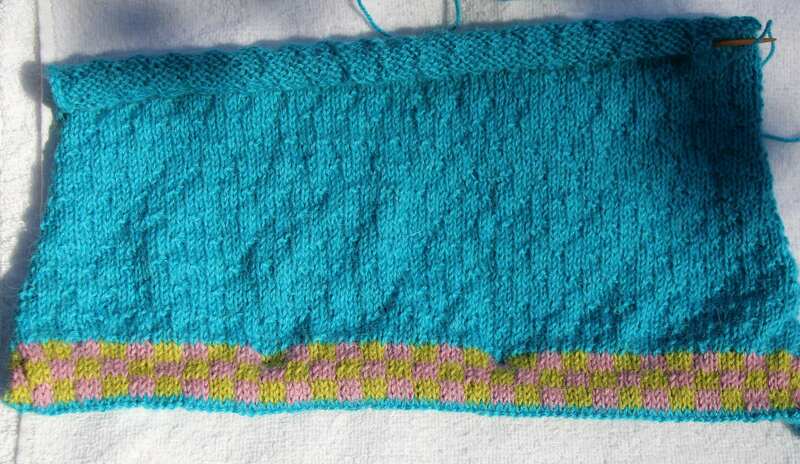 The knitter becomes unsure as to whether the instructions should be worked on a right side or wrong side row. The confusion is compounded when “next row” instructions include such gems as purling on a right side row, or knitting on a wrong side row. Do everything you can to number rows and rounds. However, if numbering rows and rounds becomes temporarily impossible the next best alternative is to make each “next row” distinct from the following “next row”. For example, “Dec Next Row” or “Next Row RS”. Always give the knitter a firm ground to stand on. The knitter needs to know where she / he is at in the pattern. Always indicate right side row or wrong side row at the beginning of any shaping. For extra clarity specify what is being shaped. For example, use the words “at neck edge” or “at armhole edge”. A knitter can be easily confused when both armhole and neck shaping takes place at the same time. Help the knitter make an initial distinction between the two. When armhole shaping ceases, remind the knitter to continue decreases at the neck edge. Provide stitch counts at the end of rows or rounds that include increases or decreases. As a designer you want the knitter to be happy with the final result. Including stitch counts is another way of making your instructions clear because it provides the knitter with check points along the way rather than completing all the increases or decreases only to find 7 stitches on the needles when there should be 3. Do not assume that the knitter understands that Row 1 is a right side row. Especially when using set up rows before starting a pattern, it is best to indicate the first right side row of the pattern. Friday I will write about how to achieve clarity when describing knitting techniques such as short rows, provisional cast ons and the like. For a long time I was a writing instructor teaching others how to produce a well written project specific to their field. There are many types of writing out there and each has its own rhythms, constructions and standards. Writing a knitting pattern is no different and so I thought I would like share what I know about the elements of good pattern writing in a series of posts. One of the most important pre-requisites to good writing of any kind is reading good writing. Immerse yourself in reading well written patterns. How do I know what a well written pattern is, you may ask. Trust yourself. You know. Take a pattern that you had no trouble understanding. A pattern whose directions were clear, whose order was logical, that you consider to be well written. Now take a pattern that you had all kinds of trouble understanding, where you kept flipping back and forth through pages to find this or that. We all have these types of patterns in our pattern stash. Take them into a quiet room with a pen and paper. Read them. What makes one better than the other? How is the information in the patterns organized? Which seems to be better organized? Why? List the reasons. Also note what you don’t like. These will be what you avoid in your own pattern writing. Does the pattern contain long unbroken lines of instruction? Or does it have breathing space, where eyes and mind get a chance to rest before moving on to the next task? Which do you prefer? Why? Most knitters, it has been documented, find that space between tasks is more restful on the eyes and mind. The space gives a clarity to the ending of one thing and the beginning of another. Knitters react with anxiety and anticipate confusion when faced with long unbroken lines of text. Think about the wording in each pattern. Is it clear? Can it be easily understood? Are row counts clear? Are stitch counts clear? Are the construction tasks clearly broken up? For example, if the pattern is for a sweater, does it clearly divide the tasks into Back, Front, Shoulder Shaping, Neck Shaping, Sleeve, and so on. Does the pattern provide the information you need to complete the tasks or do you have to guess at what the next step is, or what the instruction means? Do you need to go to outside resources to complete a task or is the information for completing the task included in the pattern? Which do you prefer: guessing what the next step is or being told? Why? Next post will be about the elements of good pattern writing. I’ll list what they are and give you ways to achieve them. For now I have to go. I hear the human bear rustling things in the kitchen most likely looking for food we don’t have because he ate everything last night at 2 am. And I hear the squeaking of wicker which can only mean Yarn Rascal is chewing on and eating his wicker bed. Wonderful.